Finding a high-quality rocking camp chair can be a difficult and arduous process. There are many makes and models to choose from, leaving you with a lot of research. Don’t waste all that time when you can use our guide of the best folding rocking chairs that keep quality and cost in mind. We’ve taken the time to compare and contrast, reviewing the top chairs for you and your lifestyle. Why Would You Need a Rocking Camp Chair? 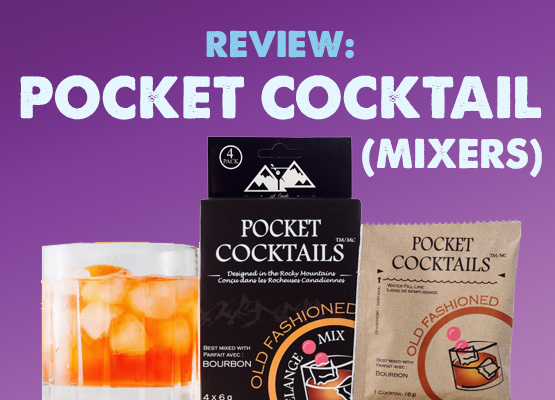 Maybe you’re someone who likes to go out backpacking. No matter where you are, a good rocking camp chair can come into use. When out in nature, or even on your patio, it is important to relax from the stressful weak. For most, rocking in a camp chair while taking a nap or reading a book is the way decompress. A chair that reclines is a great way to relax while out in the woods, or even your backyard. Where Can I Use a Folding Rocking Chair? These chairs are used in a variety of settings, making them an ideal purchase for anyone who wants to spend time in the outdoors. See if one of these uses matches your lifestyle. If you like to participate in ay of these recreational activities, or hangout in these spots, then maybe a rocking chair is your next purchase. What Do I Need to Look For in a Rocking Camp Chair? 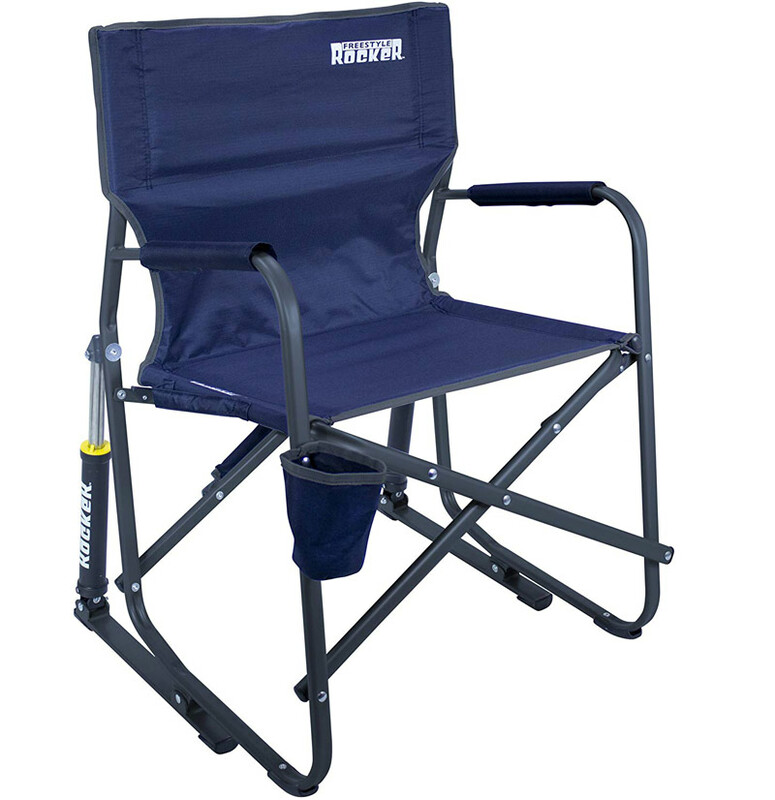 To avoid unwanted injuries and strains on your back, you will need to equip yourself with a good rocking camp chair. In this guide, we have reviewed our top 5 best folding rocking chairs with the following features in mind. All of these qualities make for an ideal reclining chair. 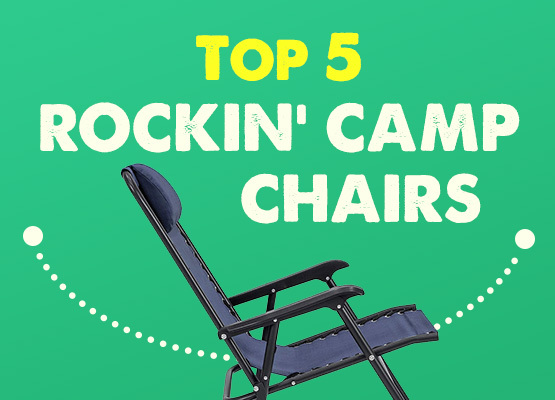 Below is our list of the top 5 options when considering your next folding rocking camp chair. When it comes to saving space, we believe that GCI makes a useful and comfortable folding chair. We found it easy to fold flat to make storage and transportation a breeze. We featured this chair first, because of it’s unique design. Unlike the rest of the chairs on this list, it does NOT feature a curved base. Instead, the unique hydraulic rocking system includes two pistons on the back. This means that you’ll be able to rock back and forth smoothly, no matter how rough the ground may be! This GCI product is made with comfort in mind with solid armrests and padding along the back section. The powder-coated steel frame will hold a person up to 250 pounds, making it reliable. • Portable with easy storage. • Smooth rocking with spring-action rocking technology. • Padding along the back and armrests for comfort. The GCI Outdoor Folding Rocking Chair is ideal for those who want to purchase a chair that can be easily broken down and stored. It has a sturdy design, fitting a user up to 250 pounds. Although it does not provide a headrest, it makes for a good relaxing camping chair. 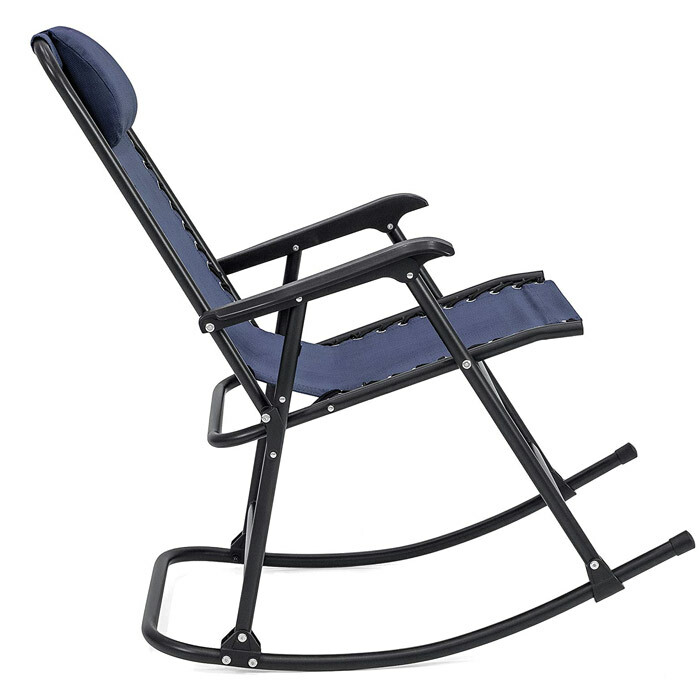 This rocking camp chair by ALPS is a no-frills alternative. It’s simple, light, and sturdy– making it great to throw in the trunk for some weekend camping trips. The seat itself is quite supportive (yet comfortable), and has having a well-formed, high back section. For those who need neck support, we found the back section to have a great deal of head support since this chair is 104 centimeters tall from the ground. In terms of the actual rocking function, the ALPS low rocker has a lower profile than the chair previously reviewed. It is ideal for those who want to lean back and relax. Instead of folding, it collapses together like a standard camp chair. 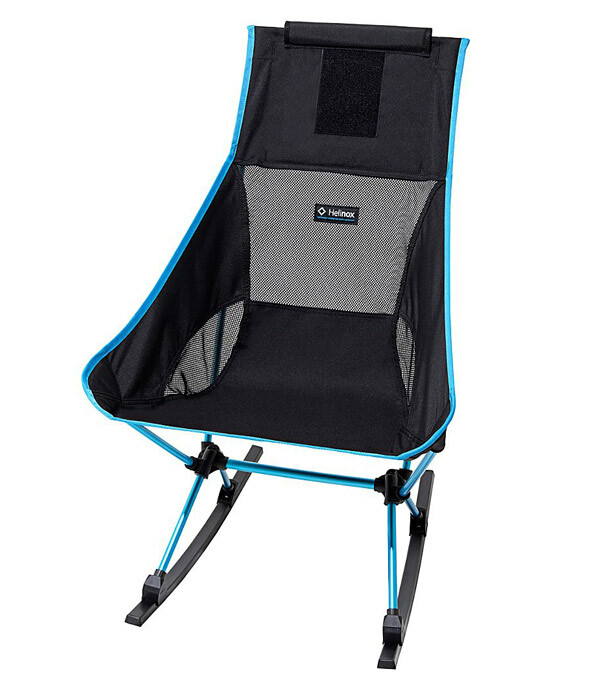 • Sturdy build with TechMesh fabric and Pro-tech powder-coated framing for a durable chair. • Low-profile rocker for a more relaxed and reclined experience. • Weight capacity of up to 300 pounds. • Lack of padding in the back section. 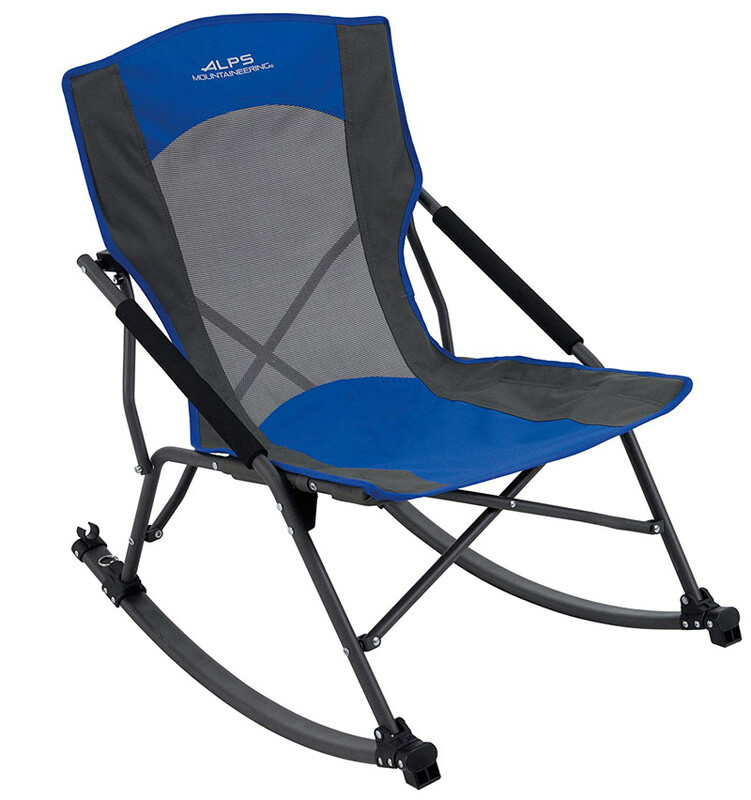 The ALPS Mountaineering Low Rocker Chair is a great purchase for those who prefer to go camping in their car or van and don’t have a lot of available room. It is simple and dependable, and as long as you don’t need cupholders or arm rests, an excellent choice for a weekend warrior chair. One of the features that we like about this chair is that it is easy to assemble. In fact, it does not require any at all. It is also quick to fold up and store for those car camping trips, although it takes up more room than the first two on this list (when folded). The light padding material extends from the tall back down to the bottom of the back section. 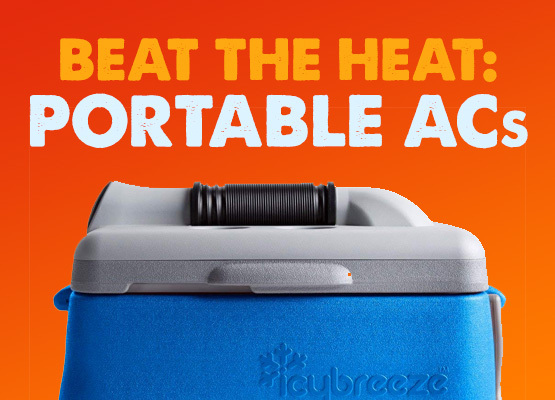 The padding itself is made up of 100 percent polyurethane foam for both comfort and durability in the elements. The chair’s steel frame supports weight of up to 300 pounds, making it ideal for those who want to rest without worrying about it breaking. We were impressed with it’s solid construction! • No assembly required for easy use. • Durable material to withstand camping elements. • Side bag to hold snacks/small items! • High back for added comfort and support. • Larger chair that takes up more of space. • On the more pricey end, averaging about 100 dollars. This rocking chair made by Timber Ridge is a comfortable addition for your next camping trip, as long as you have space in the car. It is easy to use with no required assembly. This chair is a bit pricier than other options and takes up a good amount of space, but is worth it due to the durability. We found this folding rocking chair to the best pick for those wanting to relax whilst on an RV trip or out on the patio. The fabric used is practically weather-proof so that you don’t have to worry. We also liked the added pillow feature. This can be flipped forward when in use, or flipped out of the way when stored. One key component to this foldable recliner chair is the ability to effortlessly rock and forth in a soothing motion. This product was designed to feel weightless as if the user were in space, hence the zero gravity title. For those who might be concerned about the sturdiness of this chair, we would not recommend it to anyone over the weight of 250 pounds. The metal itself is durable, but is not built with the same steel frame that was found in other chairs. • Easy to fold up and store in your RV or on the patio. • More affordable option, averaging about 50 dollars. • Comes in variety of different colors for a personalized look. This recliner chair is a great candidate for the patio or RV– in fact, it’s better to think of this as your standard outdoor furniture that happens to also fold. We found the effortless reclining feature to be exceptional when compared to similar products. It does come with a pillow, but that might not be enough support for your head. Backpacking gear is all about conserving space and weight. So this thing is small. But when you’ve got time to kill on the trail, a foldable rocking chair might be a great little past time. It has a single shock corded pole structure that is perfect for a quick and easy setup while on the trails. Another feature that we found beneficial was the fact the rocker legs are able to be removed. This makes the chair extremely easy to break down and become portable. What hiker wouldn’t want a chair that could fit inside their backpack? As for how comfortable it is, there is a high back which allows the user to have a good headrest. As shown in this review, we found that not all rocking chairs do not have this feature. The back portion of this object is wider to add an extra layer of comfort. The biggest downfall to this chair that we found was that it does not provide the best rocking motion, but that is to be expected given how portable it is. • Comes apart easily and can be packed up in a bag. • Higher and wider back portions for added comfort. • Can be converted into a chair with the removable of the rocker legs. • More expensive, ranging in price from 160 to 175 dollars on average. • Does not have the smoothest rocking motion. The Hellinox Chair Two Rocker is an asset for backpackers who are looking to recline in the woods. It is easy to take apart and fit in a backpack. This chair can also become a regular chair as the rocker legs are removable. Consider paying a few bucks more to buy this portable and comfortable backcountry chair. 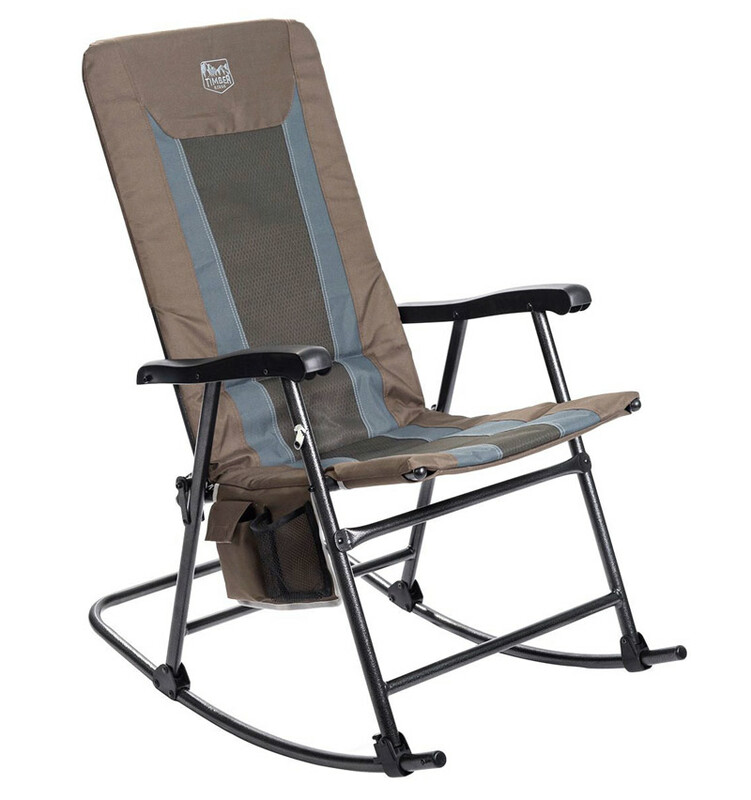 When looking for a suitable folding rocking camp chair, it is important to take the setting into consideration. Perhaps you frequently take RV trips or go camping in your car or van. Maybe you’re a backpacker looking for a portable rocking chair. Regardless of the intended use, it’s important to review the price, comfort, and durability of the chair. We hope that this review has helped to provide you with a chair that will give you a chance to relax in the outdoors for whichever lifestyle you have! 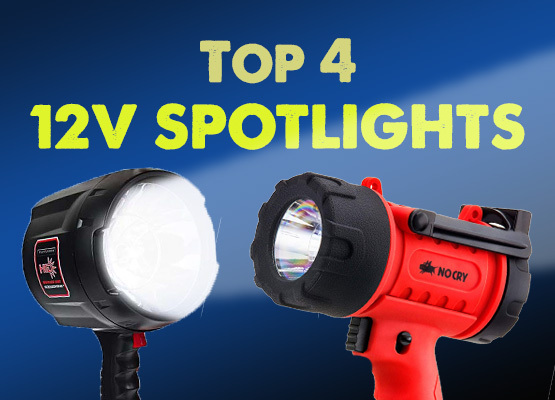 ← The Top 4 12V Spotlights – Corded & Cordless!